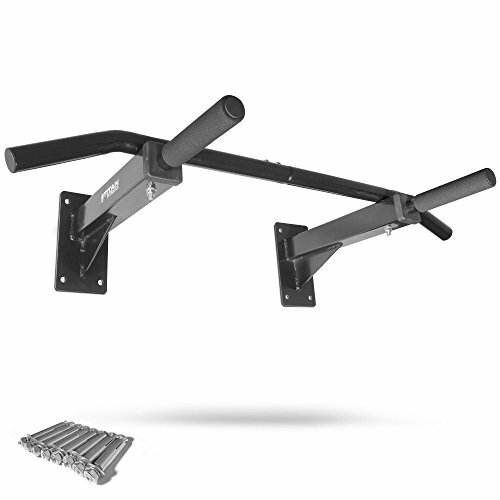 Titan Fitness's multiple grip pull-up bar has 1 center bar that extends into a handle on each side and parallel bars going forward. With all of these available surfaces, many different pull-up grips are available depending on which muscle groups you want to work. The comfortable padded foam handles are easier on the hands than knurled surface bars and work better with bare hands than with gloved ones. Mounting at a height just at the tips of your fingers allows you to do pull-ups without touching the ground. The center bar is perfect for use as a mounting place for our resistance bands! Dimensions: Width - 35.75", Depth - 20.5"